India’s largest low-cost airline company IndiGo, official Twitter (@IndiGo6E) seems to be hijacked. As account is being used to re-tweeted an adult picture. One of the member of the company's had remoced the offending tweet. 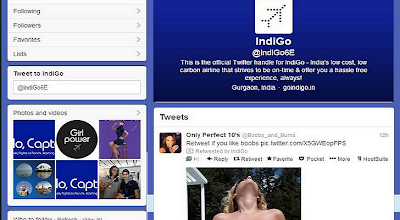 Till now company is investing about the tweet, and yet not confirmed for any kind of security breach. If it was the security breach then it shouldn't be surprise anymore, as can see that large number of the twitter accounts of major organisation are being compromised every week. All the hijacked accounts of major organisation are being abused for spam.